Degenerative Joint Disease - Also referred to as Osteoarthritis this form of arthritis is the result of cartilage destruction. The Cartilage protects the bones which make up the joint. Osteoarthritis is a chronic disease and it is usually noticed in older dogs that have had years of abnormal stress on their joints. Cartilage does not have any nerves so it can take a long time for damage to be noticed. The cartilage breaks down and pain and discomfort is caused by the bones rubbing together. When you are worried about your pet dogs or puppies it is wise to make general observations and a note of your dog's general well-being before considering a health issue and problem such as Dog Arthritis. Overall physical condition? Mental attitude? Appetite? Condition of bowels and urinary apparatus? The nose of healthy dogs or puppies is moist and cool but in sick dogs it is usually hot and dry. Hair loss? Dry skin? Discharges? These general observations are useful to consider whilst checking out the symptoms of Dog Arthritis. Inflammatory Joint Disease - This form of arthritis can be caused by infection or an underlying disease. Multiple joints are affected with Inflammatory arthritis and the dog can also suffer from fever, and stiffness all over its body. Inflammatory joint disease can be caused by bacteria, by tick-borne diseases and fungal infections. Dog Arthritis symptoms - Inability to get up after sleeping or resting. Dog Arthritis symptoms - Reluctance to exercise. Canine Arthritis treatment - To confirm a diagnosis of arthritis it is vital that your dog has a full physical examination by your Vet or Canine health care professional. 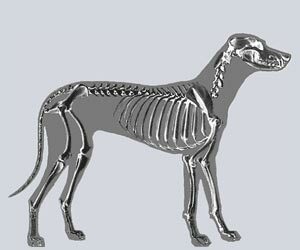 Canine Arthritis treatment - X-rays may also be required in order to confirm a diagnosis of canine arthritis. Canine Arthritis treatment - The treatment of canine arthritis is palliative but the dog's weight should be carefully monitored as obesity will aggravate the condition. Canine Arthritis treatment - The dog's bed should be checked to ensure that is warm and dry. Pain medication is often required to relieve the pain and possible swelling. Palliative Care comes from the Latin word 'Palliare' which means 'to cloak'. Palliative care is the term used to for any type of medical treatment or care that aims to reducing severity of the symptoms of a disease as opposed to finding a cure or reversing its effects or progression. Palliative care aims to prevent and relieve any suffering and to improve quality of life for dogs suffering from serious, complex illness. Pet Insurance for Dog Arthritis. Remember canine insurance / pet dogs health insurance for treatment of health and medical problems such as Dog Arthritis. Unexpected visits to the vet and veterinary treatments for your dogs and puppies due to illnesses such as Dog Arthritis can quickly add up so get quotes for canine health / pet insurance coverage for treatment due to accidents, treatment of illnesses, prescriptions, surgeries and possible hospitalization treatment for your dogs or puppy. Get the best deals for pet insurance from pet insurance comparison websites - make sure you get the best rates for canine health insurance to cover visits to the Vet for the diagnosis and treatment of unexpected ailments such as Dog Arthritis. The sole purpose of the Dog Arthritis section on the Dog Symptoms and Canine Health website is to act as a reference guide to provide useful information to the owners of dogs and puppies. This article on Dog Arthritis is not intended to be used to diagnose or treat sick dogs or as a substitute for obtaining professional veterinary advice. Please remember that if you are in any doubt about your Dog's Health, or problems associated with Dog Arthritis, please consult your Canine Veterinary Specialist immediately for professional treatment. Your vet will diagnose whether Dog Arthritis is the problem and prescribe appropriate medication and treatment.